Looks more expensive than the price tag suggests. The Daewoo KOR6N7RS features a decent overall build quality, including a stainless steel cavity. Quite small - best suited to smaller families and households. Considering the price tag of just over £60, the Daewoo KOR6N7RS offers very good value, with a beautiful stainless steel finish to both the exterior and interior. The right hand control system comprises of both buttons and dials, all of which are labelled with symbols as well as text, which is a refreshing change. The overall design and finish of the KOR6N7RS was liked by our test team, with the stainless steel exterior not looking out of place in more expensive kitchens. Many budget microwaves tend to have a cheap appearance to them - not so with the Daewoo KOR6N7RS, which for the price tag is remarkably well designed, and several of our testers initially thought that the price of this solo microwave would be considerably higher than the current RRP. If aesthetics are high on your list of priorities, then you won't be disappointed. In terms of power it provides 800w, divided into 5 different power levels, ranging from defrost to high - which should be ample for the average user. 4 different Daewoo auto cook menus are also provided for ease of use when cooking common food types - in practice this helps to save time, and avoids under or over cooking food. The Daewoo KOR6N7RS's controls are very well labelled, and our team found them easy to use without consulting the manual - as suhc this model will be ideal for those who struggle with technology. The interior cavity is finished in stainless steel, which makes cleaning and maintaining the KOR6N7RS an easy operation. The majority of microwaves in this price range tend to have an acrylic interior, and so to feature a stainless cavity is a real bonus. 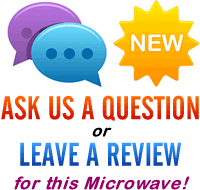 The only slight issue we found was that this silver microwave oven moves slightly when opening the door - so you may wish to place it on a mat to avoid this issue - asides from that our testers loved it. As mentioned previously, the main selling point of the Daewoo KOR6N7RS is it's looks - in terms of performance it functions as well as the majority of solo microwaves in this price bracket. 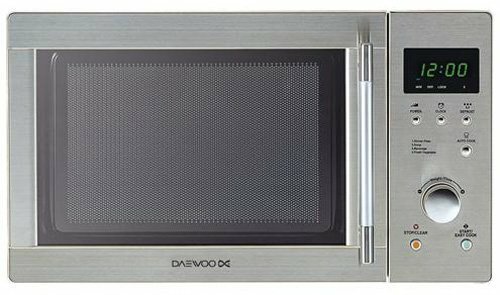 If you like the modern sleek design, and just require a compact solo microwave for you home or workplace, then the Daewoo KOR6N7RS is a fine choice, and one that you will not regret. During the test it cooked well, and no issues regarding reliability or performance arose - we would highly recommend the KOR6N7RS to our readers. The KOR6N7RS is a good looking and reliable solo microwave, and priced very reasonably too. If you're in the market for a small solo microwave, which doesn't cost the earth but at the same time doesn't look like a cheap model, then the Daewoo KOR6N7RS is probably the best choice on the UK market at the moment. It's well worth considering if you're after a cheap yet reliable solo microwave.